58% of car buyers consider electric | What Car? More than half of all new car buyers would consider buying an electric car in the next two years, according to a survey by Chargemaster, a producer of electric vehicle charging points. The research sampled 1032 people across the country. It suggests that 58% of those planning to buy a new car over the next two years would consider going electric. This increased to 77% of those in the 2534 age bracket, and 81% of respondents who live in London. 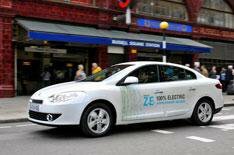 Londoners had by far the most positive response to the idea of owning an electric vehicle. Around 29 new electric cars are expected to go on sale over the next 18 months, from manufacturers such as BMW, Ford, Renault, Vauxhall and Volvo. Electric cars currently on sale include the Nissan Leaf and Renault Fluence ZE. The lack of a national charging infrastructure was highlighted by the report, with 83% of people saying this would negatively affect their decision to buy an electric vehicle. However, 78% of respondents felt that if at least 40 local public charging points were available, this would positively affect their likelihood of buying an electric car. This increased to 91% of respondents who live in the London area. David Martell, chief executive of Chargemaster, said: With a number of major car manufacturers close to launching and promoting their electric vehicle (EV) ranges to the mass market, it is has become increasingly clear that consumers are now seriously considering purchasing an EV. The availability of more charging options will play a critical part in encouraging these consumers to make a positive decision to go electric.